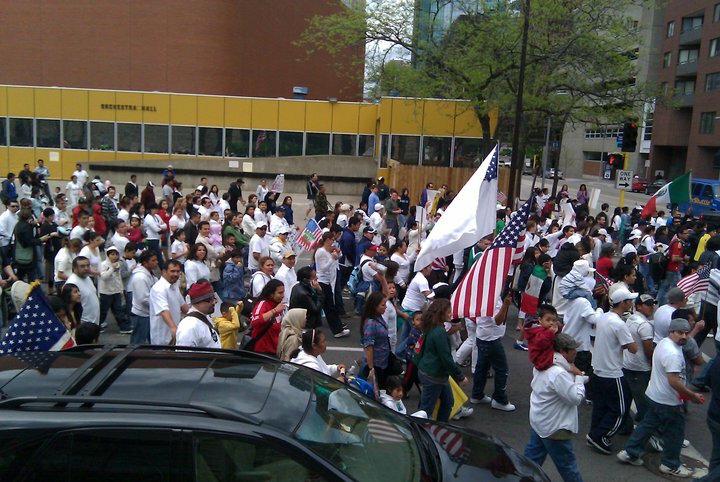 I was part of the May Day “Immigration Reform” march and rally here in Minneapolis. The next day, my excitement and hope for real change, began to melt into frustration as I read comments about the rallies in news accounts and on facebook. In my next few posts I want to explore the desires and motives that brought myself, and thousands of others into the streets. Why is there so much fear and misunderstanding? Why are people drawn to polarization rather than to cooperation? The article in the Star Tribune gave us a head count at 2,000, yet mischaracterized the march in it’s opening sentence, “Marching Behind a Mexican flag….” I saw much of the march, I was a lead chanter (I got a loud voice so they gave me a little megaphone!). I was up and down the sides and for every 1 mexican flag there there was at least 20 “old glories”. I’m sure the reporter saw people, somewhere, behind the red-green-and white, but the overall tone of the event was pride in the USA. The Minneapolis march was actually 3 marches. One began in North East Minneapolis where there is a growing Latino presence, the other two begin in South Minneapolis one came up Chicago Ave. from Lake Street, the other started at King Park on 42nd and Nicolette Ave. As the crowds met at each location they proudly displayed their banners to the passing crowds. Many drivers honked and passengers yelled support. Only twice during the entire 3 hours did I witness tension, both times an angry middle-aged European-American men shouted profanities at the crowd, both times the marchers did not return the hateful aggression but either ignored or tried to creatively engage the assailants. “El pueblo unido jamas sera vencido!” “The people united will never be defeated! Over the next few posts I’ll work to explain how this issue impacts myself and others, and why I see it as THE issue of this decade. The church must choose to be either a prophetic voice in the wilderness or one more sheep following the blind shepherd of politics. Previous PostCourage to Confront Poverty’s Persistent PresenceNext PostEmancipation and Migration: Part 2 – Should Birth be “the Accident” that defines life chances? Those who choose to break the law vicitmize themselves. You really don’t need the angry white boogy-man to feel like a victim. Come here leaglly and your welcome. All legal immigrants, strangers from other lands seeking a way to identify with the sacrifice of the blood and treasure from those generations past, know that citizenship should be difficult to obtain. That’s the difference, those who appriciate this country for what it is and want to add somthing, and those who want somthing very precious and valueable for nothing. They are the victims of their own self-destructive short-sightedness. They chose to come here under the current system if laws. They choose to expose themselves to the pains and peanelties of those laws. The question now is, how much we value this citizenship that others seem to take for granted?No amnesty, no free pass. Citizenship is given freely everyday…just not to those from other countries. When hard working people come here and do jobs “Americans” turn their noses up at everyday, why make it so expensive that people who would lawfully choose to become citizens can’t because of the cost and legal mumbo-jumbo they need to go through to complete the process. I think it is sad and unacceptable!